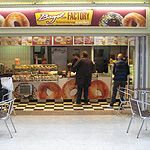 Bagel Factory is located at Marylebone station making it ideal for breakfast or lunch on the run. Do you work at Bagel Factory? What did you think of Bagel Factory?